It’s been so fun swapping in brands every week or two during the pop-up shop. A lot of work, but fun: it feels like a different place, a slightly different atmosphere, every weekend. On Wednesday this week we exchanged The Armoury for Drop93 - the pre-owned and consignment store from the Armoury team. And we welcomed in Edward Sexton. This is a significant launch for Edward Sexton as it is the first time they have done ready-to-wear trousers. Fortunately, the Hollywood-top style (above) is meant to be loose in the leg and cinched slightly at the waist, so it is easy to fit a range of body types. For anyone that isn’t familiar with the Hollywood-top style, it is a relaxed, high-waisted cut with what’s called a ‘grown-on’ waistband. Basically, it looks like there is no waistband at all, and inside there is less structure than a normal band. A series of belt loops then run a touch below the top of the trouser. Sexton started cutting them bespoke last year, and you can see my review of my bespoke ones here. The RTW styles are cut like a traditional high-waisted trouser - so sitting on your natural waist, above the hip bone - unlike mine which were a little lower. They are in three different VBC flannels, all 11oz, and cost £420. 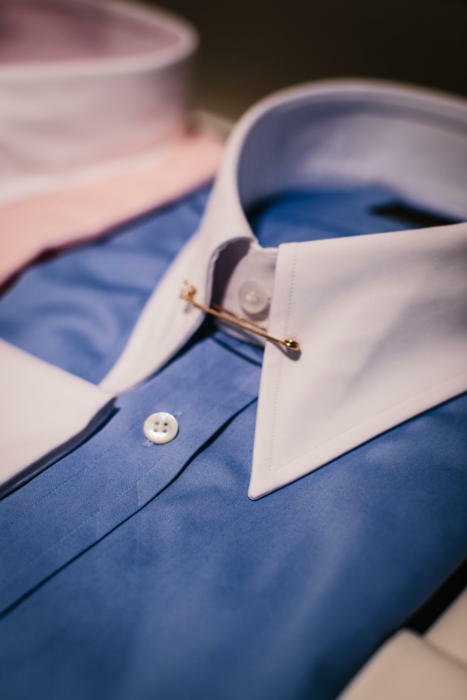 Sexton’s other offerings are the pin-collar shirts they’ve had for a while (£190) and silver and gold pins for them (£140 to £510). There are three-fold and seven-fold ties made by Bigi and designed by Edward and Dominic (£110 and £190) and some other accessories. 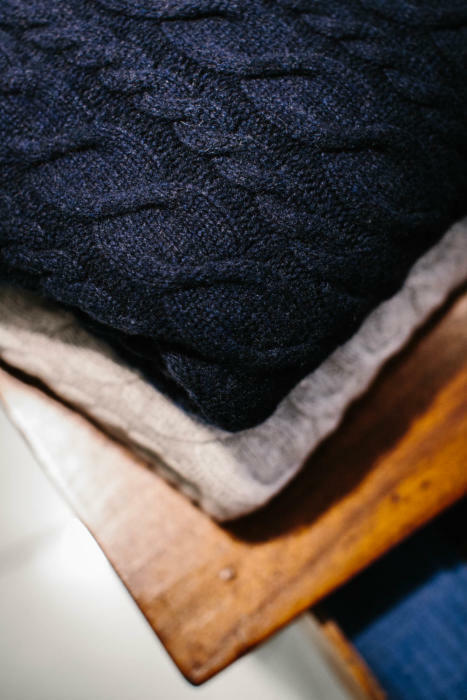 The knitwear is new this year - cashmere and wool rollnecks, and a chunky cashmere cable-knit. 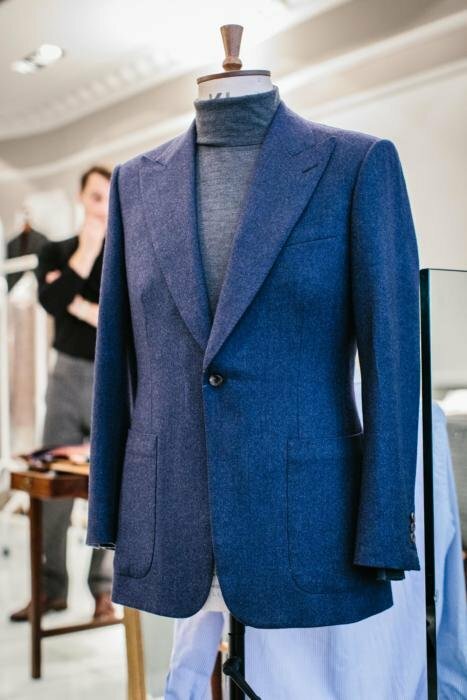 I’ve always associated Edward with rollnecks under tailoring, so it’s nice to see those in their collection. A few readers on Instagram have asked about how to access these things if they can’t get to the pop-up shop. The concept of the pop-up shop has always been to bring together brands that you can’t normally access in London - either because they’re online only, or because they are based abroad. So the brands tend to have everything available in their web shops as well as the pop-up - and these pieces are relevant to everyone, not just those that can wander down to Savile Row. You can follow the discussion on Edward Sexton ready-to-wear: Hollywood-top trousers, shirts and knitwear by entering your email address in the box below. You will then receive an email every time a new comment is added. These will also contain a link to a page where you can stop the alerts, and remove all of your related data from the site. How does the quality of the ties compare to that of Drake’s models? Sexton chose Italian flannel for their trousers? How sad. The 11oz VBC flannel is as far as I know the same flannel Suit Supply uses for their flannel trousers. 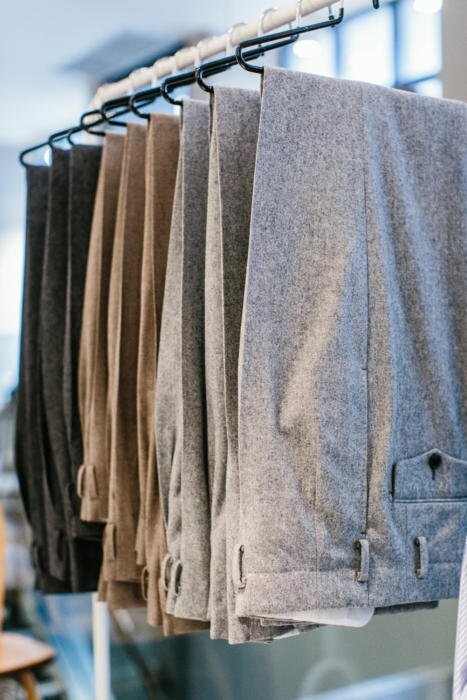 Who makes the Sexton RTW trousers? So far, for me, this seems more like a «money grab» than anything else. The fact Suit Supply uses it doesn’t necessarily indicate anything – I have bespoke suits in VBC flannel. The make on the Sexton trousers is good and it’s really not easy to get somewhere to make to this design, particularly the waistband. I know you have bespoke suits in VBC flannel, and sadly lots of other suits in regrettably inferior cloth. I am a big fan of this blog, but I would really hope you had an «awakening» soon in relation to the quality of cloth as there is almost nothing good left in the industry. With your position I am sure you could help lead a movement to get proper cloth on the market again. It needs to happen soon before the last of the know how and the ingredients required to make the cloth of old is gone. Have you tried vintage Lesser (old Golden Bale for example) or London Lounge suiting? The way they drape and hold their press is significantly different to what is currently on offer from the usual books. And it is not a matter of weight, as I have a 9/10 oz vintage Golden Bale thst drapes and holds its press much better than 13/14 oz modern cloth. Same goes for 9oz London Lounge Piuma which is a league apart from cloth at same weight. Thanks. I have seen both in action and do have some old Lesser. It’s rarely purely a question of weight, though it helps. More often it’s about the weave and the set of the loom (density), which give the cloth more body (something covered in the Guide to Cloth series). Thanks Simon. That’s the point, almost no cloth commercially available now is produced to the level of vintage Lesser or London Lounge (in respect of drape, holding press etc). And as I pointed out these cloths achieve these characteristics even at relatively low weights. If you can recommend any cloth bunches on the level of vintage Lesser or LL in this regard I would highly appreciate it. The London Lounge Cloth Club seems to be winding down, and I am worried that soon I will have no more cloth worthy of bespoke. Thanks Simon. I think it would be a great idea for a piece by you. It would be really interesting reading you using a journalistic approach to (i) finding out what specific physical characteristics of cloth produce those qualities we now discuss, (ii) identifying why such cloth is almost not produced anymore (demand? cost? know how? ), (iii) which bunches still come close to that quality and (iv) what can be done to save / resurrect such cloth for the future. There is a lot of fluff on the WWW about cloth, I think your journalistic approach would be highly appreciated by many of your readers. LL is not winding down, and Michael continues to develop an interesting range of cloths which surpass by a mile anything available from normal mills. SC knows little of this, and would be well advised to explore a little in an effort to broaden his (and therefore his reader’s) horizons. As above, more substantive information always welcome, on technical differences or actual comparisons among other bunches. LL Cloth Club certainly isn’t as active as it used to be and Michael Alden himself has indeed said it is currently on «life support». Hence all those interested in bespoke clothing and quality cloth should do what they can to buck the trend. 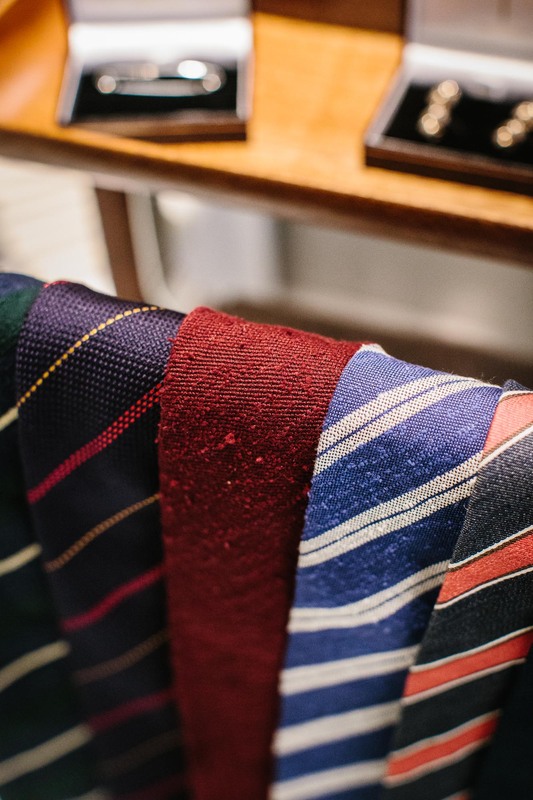 Dugdale, Smith Woollens, Lesser’s, W. Bill… all offer sturdy British cloth. Any good tailor can show you bunches with substantial fabrics. Doubt very much that Sexton has much to do with anything other than the basic design of the trouser. He wouldn’t chose a VBC over a Yorkshire mill. No, I have no commercial stake in these companies – thanks for asking. We just charge each of the brands rent for being in the shop. Absolutely. The pop-up shop is me bringing together brands we already love and I have already written about – without any financial involvement there, unlike others – and giving them a physical space. We have to charge rent as we’re paying rent ourselves. I love tailoring and the craft like other PS readers but tailors are business people and need to make a profit like any other business. So I would hesitate to condemn a new product or service as a “money grab”. It can be an attempt to generate new revenue to replace falling revenue in another area . Producing some RTW garments can be a completely reasonable move by a tailoring house. Especially if profits from it can keep the bespoke side alive! What is the point you are trying to make here? VBC in general produce some of the nicest fabrics on the market and have done for many years! Italian flannel of course is different to English in terms of the wool used and the way it is spun but it doesn’t make it any lesser or ‘inferior’ to other materials available in the market. I have had suits made in a huge array of fabrics and my Barberis ones stand to the test of time. I think your comment in general is very ignorant and maybe instead of being a keyboard warrior over this blog you should find the time to go to the Barberis mill or better yet do some research! I have a grey flannel suit from 1996 made of Vitale Barberis Two Ply and must say that after 21 years the suit is still in very good shape. So the the quality of that cloth seems not to be inferior! The odd RTW piece , accessories and pop up stores ….. any chance of the PS off the rack suit or jacket n the future? No, no plans to do so. They look fantastic. Are the 3 colours biscuit, charcoal grey and silver grey, and do you have a favourite? Can they be taken in at the waist if needed ( I am typically <30") and does the price include any alterations? More generally I have 2 pairs of light grey flannels and 2 pairs of navy flannels (of various qualities, but all reasonable and one exceptional). Would biscuit be a good next choice for colour, and if not what would you suggest? Yep, that’s right, and my favourite is the silver grey – but the others are both really nice too, and versatile. Given what you already have, I’d go for biscuit if you’re happy with that being fairly casual, and dark grey if you want something smarter. The price doesn’t include alterations, no, but you could have them altered easily. Are Drop93 competitive on Price being secondhand? Sorry for the slightly rambling / unclear question but this type of thing is where you shine! I wouldn’t ask an online service to do something like these Hollywood tops – they’re complicated and they probably haven’t done them before. If you want flannels to look more relaxed, though, then a wider leg might be nice, and perhaps don’t worry about keeping a hard crease pressed into them. Go for cuffs as well perhaps – they’re a little more casual. And if you like the look of these Sexton ones, then you could have forward-facing pleats, though if anything they’re a bit more dressy. I’d be really fascinated to see a PS review of the shirts and trousers by Luxire at some stage Simon. I’ve got no personal experience, and I’m incredibly sceptical of online MTM services, but this is the one name I keep seeing pop up over and over again – both in the comments here and on a number of instagram accounts I follow (Andreas Weinas etc). Yes, good point. It is on the list! Luxire will respect the given measurements to the letter (or to the 1/8″), and the workmanship is superb. That much I’ll say for them. The only snag is knowing your measurements, and there are quite a few of them to fill in when you place your order. The best way, I found, is to take those measurements off a pair of trousers that fit perfectly, and keep the same style details (or you will undo all the good work). Finally, Luxire are fast (if they have the fabric in stock you could be wearing your britches within a week). I’ve several pairs of trousers made by Luxire based on precise measures from my true bespoke trousers. What they send back, using eg Dugdale flannel, cord, or VBC cloth is, quite frankly, extraordinary. If you can get great trousers from them in good quality cloth for sub £200, why would you even think about spending four times that amount for stuff which, in Simons own words, doesn’t fit terribly well? Luxire appears to offer some adequate facsimiles of traditional Italian work at much lower prices, being largely by machine and in India. Unfortunately, the real problem with online tailors like Luxire is not their capabilities or skills, but that they’ll do anything their customers request. And without the guidance and discipline of a “real” tailor, some people manage to design the most ridiculous articles of clothing ever witnessed by human eyes. I’ve seen the ghastly results of some of these requests on certain style forums; comically high waisted trousers with 5 button closures on a 9 inch high waistband and side adjusters and on and on. As online etiquette forbids complete honesty, you see reviews praising these clownish wares. Indeed, Luxire can produce some inexpensive copies of Ambrosi and Pommella and other Neapolitans – but also some of the most churlish and clodhopping trousers that no legitimate tailor would ever agree to create. what nonsense Jackson. Don’t expect luxire to say “I’m not making that for you because I think you have lousy taste”. they make what the customer orders. cannot believe you wrote that. They do, they should (Note that I didn’t say they shouldn’t) and much of it is hideous. And yes….there are things that Antonio Liverano and Salvi Ambrosi will absolutely refuse to do no matter how much you paid them, and there is a certain old school Italian charm in that that simply does not exist in the Luxire model. The laws of exponential satisfaction doesn’t work with tailoring. Just because a 3 inch waistband looks nice doesn’t means a 12 inch high one will look even better. Some people would benefit greatly from bespoke tailoring advice. Er, Luxire are made-to-order tailoring company, not a bespoke tailor or a tailoring consultant. Apples and oranges. Also, if much of their work is hideous, it’s entirely the customers’ fault. Given their price and business model, their customers are men on a budget, who are statistically less likely to look like demigods, so they will always look worse than the average bespoke buyer. I agree with everything you wrote and stand by everything I wrote. The two are not mutually exclusive. I don’t think you are focusing on my point, which is probably my fault. so Jackson, would you give that advice to vivien westwood, or Salvador dali because they did stuff which wasn’t normal? I’m not sure the luxire model is trying to do old school italian charm actually. except that if you send them something old school Italian to copy they will make a pretty good job of it. I think Luxire serves a great market and appears to do it well. Take another quick look at my post – I didn’t give anyone any advice. I am not sure what you think I wrote, but I apologize if I didn’t make myself clear. I was merely stating my opinion and, given that I don’t mind what people wear as long as it makes them happy and I don’t have to wear it, I wouldn’t change a thing about Luxire’s business model or its customers’ choices. However, I find the subject interesting enough to comment on it – which is my choice. interesting clothes, especially the flannel trousers or cableknit-sweaters. They seem to be easy paired with various sweater or trouser colors because they are either light or dark in color. Do you have an advice how to pair medium colored items well? E.g. a medium blue sweater or shirt or medium grey trousers. Do they pair well with other medium colored items? thanks for your answer. So are the medium colors used as separation between extreme light and dark colors, to lower the stark contrast? For example, a way to wear charcoal trousers together with a white shirt, separated by a medium colored knitware and a dark brown belt. Or do you have a specific combination in mind to demonstrate the ideal use of medium colors? It seems, that they are easier to use as knitware than as trousers? No, you generally don’t need medium colours to sit between high-contrast ones. Just dark or light ones to add contrast to a medium outfit. It’s rare you’ll have a problem with there being too much contrast, but too little is often an issue. Hi Simon, what’s your opinion on trouser leg / opening width these days for dudes our age who are in decent shape? Cheers. For trousers that will not be worn with a suit, do you recommend cuffs? Cuff size? Thanks. recently i had a bunch of trousers made and for some reason one of the clothes i picked was a very deep brown with a bit of red in it. Mind you it’s neither burgundy nor a really dark brown but rather a very… deep brown with leaning a bit into reddish. The pants themselves are cut almost like chinos and the fabric has a similar feel. I was really looking for the pants but now that i have it seems they don’t match with anything. They just look weirdly brown. Can you provide some advice on how to wear them? When do you expect availability on the short sleeve polos.?? What factory uses Edward Sexton for this RTW jackets and trousers ? A factory in Italy ? Is it close to the quality of a Belvest jacket ? Hi there, where can one purchase these trousers – they aren’t on the Sexton webstore? Is there somewhere to get these online? Could you please give me your opinion about Edward Sexton’s MTM offer (the so called Offshore Bespoke)? The offer seems interesting, but so far I have not read any independent reviews about it. Is 11 oz a little bit light for flannel trousers?